280 pages | 52 Color Illus. Most landscape architectural designs now include some form of digital representation - but there is much more scope for creativity beyond the standard Photoshop montages. 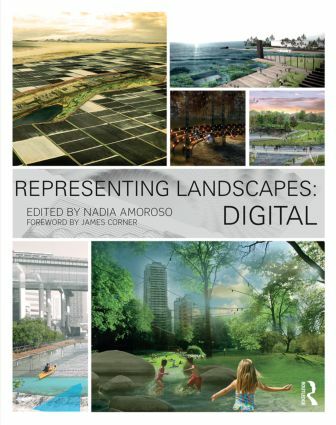 In this new book on representing landscapes, Nadia Amoroso brings together contributions from some of the leading landscape departments in the world to explore the variety in digital illustration methods. In each chapter, leading lecturers, professors and practitioners in the field of landscape architecture explain a specific digital approach with the use of images from their department to show how each technique can be used in inspirational examples. Throughout the book over 200 colour images cover the spectrum of digital representation to help discuss the various drawing types which are invaluable when communicating ideas in the field of landscape architecture. With worked examples in the chapters and downloadable images suitable for class use, this is an essential book for visual communication and design studios. Nadia Amoroso is an academic in landscape architecture whose work focuses on the role of visual representation, digital media, urban design and creative mapping. Amoroso is the Director of Amoroso Studio, focusing on landscape and urban design representation and creative cartography. She was the co-founder and Creative Director of DataAppeal™, a data-design visualization and GIS company. She also teaches design studios at the University of Guelph. She holds and has held a number of international academic and administrative positions including Lawrence Halprin Fellow at Cornell University, the Garvan Chair Visiting Professor, and Associate Dean. She has a PhD from the Bartlett School of Architecture and degrees in Landscape Architecture and Urban Design from the University of Toronto. She is the author/ editor of number of books including, The Exposed City: Mapping the Urban Invisibles, Representing Landscapes: A Visual Collection of Landscape Architectural Drawings, and Digital Landscape Architecture Now.